In the past 5th wheels I have owned I found that one will always want more. More as well means more money. Each 5th wheel has been a new step forward for me. I started many years ago with a 33 foot monster with one slideout. BTW, this as well was a replacement for a bumper pull trailer. Today I know a RV needs at least one slideout for comfort. 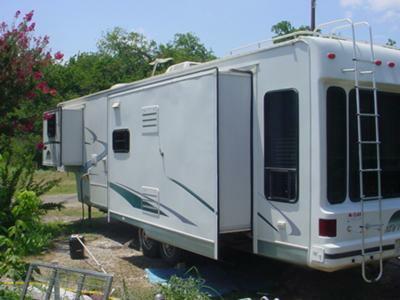 Now my new project begins with a whole different 5th wheel as the RV above was wrecked beyond repair. I have always told myself that I will never buy a new RV due to costs and layouts. So, I started looking around. Went to the money hungry RV dealers and all I saw was either junk or something that did not fit my budget. Found my dream keeper parked in a front yard. I went and asked if it may be for sale and was told everything he owned was for sale with a big smile. The owner asked me to make him a offer. I told him I had no idea what to offer. He told me to wait and he would have his wife get on there PC and find out what it was worth. She found nothing, so he asked me if I would give him $1,500.00 for it. I told him I would have to think about it and talk it over with my wife. Went home and I got on my PC to see what it was worth. Where his wife looked I had no clue, but I found out it was worth over $16,000.00. 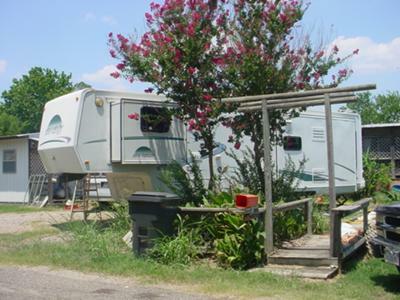 It is a 2001 New Vision Sportsman with 3 slideouts. 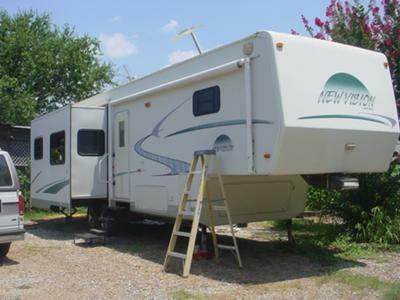 I went back with cash in hand and now have my dream 5th wheel. 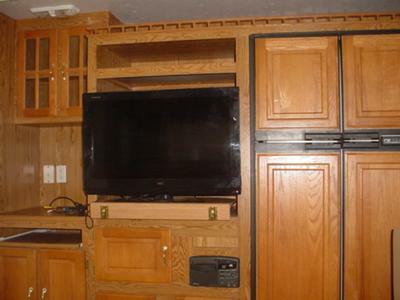 BTW, this has a 4 door fridge that is worth more than what I payed for the RV. Now my new project begins. Not much to fix, but want it to fit our lifestyle. *Ed. comment; Proof, if you've not got a thick wallet... there's still opportunities for you! Great!!! Walt started me looking and finding out about my Norcold fridge. Sure enough, there have been two recalls on this model. I called Norcold to find out more and they told be to shut off all power. That being said I asked more as to why. Fire just like Walt stated. My suggestion now for all others that do have a Norcold fridge, call Notrcold as yours is under warrantee if it has a recal. No matter how old, it will be fixed for you free of charge. Will be fixed by the end of the week. Thanks Norcold and a special thanks to Walt for this information. Brian you rock!!! Good for you. You bought that for what? They gave it to you. Sure wish I could find a deal like that. Good luck on the 5th wheel and keep on posting more pictures.